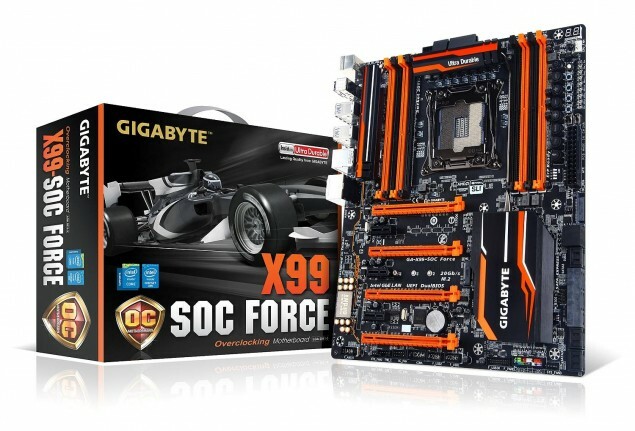 Gigabyte has unveiled their X99 SOC Force motherboard which is the second motherboard they have previewed this month and a part of their upcoming X99 product lineup. We got to see Gigabyte’s X99 Gaming G1 WiFi board last week which is an enthusiast oriented gaming board while X99 SOC Force keeps things focused towards high-end overclockers with a variety of tools and features. The Gigabyte X99 SOC Force is the flagship overclocking motherboard of Gigabyte’s lineup featuring the ATX design form factor and keeping things geared up for the performance enthusiasts. It features the orange/black color scheme from previous iteration of SOC and OC branded products such as the recent, Gigabyte GA-Z97X-SOC Force motherboard. The Gigabyte X99 SOC Force motherboard features three sets of heatsinks, one fitted above the PWM section, one along side the power section near the I/O panel and the biggest chunk featured on the X99 Express PCH. The heatsinks are connected via a long heatpipe that dissipates heat for better thermal load management. Gigabyte’s X99 SOC Force motherboard features the LGA 2011-3 socket which will be able to support Intel’s next generation Haswell-E processors with quad channel DDR4 memory controller. The Haswell-E lineup is launching on 29th August 2014 so you better start saving money for this bad boy if you want a piece of it since it’ll not be retailing at the price of its mainstream-performance Z97 platform equivalent. The Z97 SOC Force retails at a price of $209.99 US so this could easily fall in the $300+ US range considering its design and features. It looks like the motherboard features a 6 Phase PWM design powered by a single 8-Pin EPS connector while the board itself is powered by a 24-Pin connector. The board makes use of Gigabyte’s Ultra Durable design featuring high-quality components. OC PCIe Swtich (Manually turn on or off each installed PCIe lane of the motherboard). OC Ignition (Maintains power to your motherboard and connected components while the system is shut down. This means that the system fans will continue to provide airflow in cold bug situations, while i-ram drive users will not lose installed data. It allows users to also test water cooling setups and allows case mod demonstrations without having to turn on the PC). OC Trigger Switch (Jump between low and extremely high frequencies in an instant). Eight DDR4 DIMM slots can be found along the sides of the socket which are able to support high-frequency DDR4 memory sticks. For storage, the X99 SOC Force features 9 SATA 6GBps ports and two SATA Express ports. There’s a PEG power connector on the top of these SATA ports while a single USB 3.0 and two USB 2.0 ports rest beneath the PCH heatsink. Expansion slots include four PCI-e 3.0 x16 slots with full support for 4-Way SLI and CrossFireX Multi-GPU functionality. There’s also three PCI-e 3.0 x1 slots and a single M.2 SSD interface for high-performance NGFF SSDs. The AMP-UP audio design can be seen configured along a orange line which shows the isolated PCB when the audio components are featured. We don’t know the exact details regarding the I/O panel but we will get to know more about the X99 SOC Force motherboard in a short while so stay tuned for Haswell-E.